Get the benefits of nature’s most nutrient-dense superfood, without the taste. Liver. It’s THE nutrient-packed food for the win, literally. As part of my healing protocol (much of which is outlined in my new keto book Fat Fueled), my doctor has me eating a pound of liver a day for the last 5 months. I know all about the power of liver… and I also know how to cook it to avoid gagging! Contrary to popular belief, the liver does not store the toxins that it neutralizes. While the liver is responsible for filtration, it does so by deactivating and eliminating impurities, not storing them. Toxins that the body cannot eliminate usually accumulate in the body’s fatty tissues and nervous system, not the liver. So no fear, do the liver dance with me! Liver is more nutrient dense than the same portion of carrots and apples – more calcium, magnesium, vitamin A, vitamin D, B6, potassium, everything. But what if you hate eating it? I have you covered! When you hate liver, but you know you should eat it but you really hate it and you don’t like the taste of it or the smell of it and your husband hates when you cook with it because it smells up the whole entire house, I got a solution for you. Liver is nature’s most potent, super food. Screw blueberries and goji berries and lucuma and mesquite, this stuff is amazing and keto. It is so dense with nutrients. It’s rich in B vitamins, especially B12 which is super important to our energy production, regulating mood and avoiding depression, heals your digestive system, makes your hair and skin and nails and all your tissues really strong and healthy. Liver is a potent source of folate, which is used for colon health and natural digestion and normal cholesterol levels. Liver is an excellent source of vitamin A. It has so much vitamin A in it. It’s actually the vitamin A that your body can use. It doesn’t need to process it, it doesn’t need to break it down, it doesn’t enzymes to do it. It just uses that vitamin A and soaks it all up and can use it for all bodily processes. In fact, vitamin A is massively depleted when we’re stressed, just like magnesium. If you live a highly stressful life, it’s very, very likely that you’re low on vitamin A. I wasn’t able to find too much scientific data about this, but I did find it in a book. I just can’t remember the name of the book, but there is a correlation between vitamin A deficiency and vitamin D deficiency. You can find that very clearly in amenorrhea. If you struggle with missing periods, perhaps ask your doctor to run a vitamin A test and there are also spot test that you can do for vitamin D.
Liver has a highly usable form of iron and if you’re iron deficient, it’s super important to take vitamin C with your iron so that your body can actually use it properly. Liver is also really rich in CoQ10, a nutrient that is really important for nerve functioning. Think antioxidant. Liver is a potent superfood, but your husband hates when you cook with it, you hate the taste of it, what do you do? I have a solution for you. It’s in a purple container, which I love even more because it matches my offices. Vital Proteins made these liver capsules. I chatted about them on a What Leanne Loves feature. 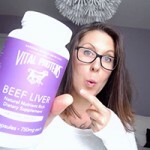 I’ve linked to that here and also below, where I recommend 6 of my favorite products once every 3 months and I talked about these beef liver capsules and you guys wanted to hear more about it. They’re just brownish capsules. I take 8 of them a day. It’s recommended that the serving size is 4 capsules, but I take 8 always in the morning. With these sorts of supplements, especially when it has vitamin A, I like to take it in the morning because I find that vitamin A makes me a little bit energized. If you’re taking your vitamin A at bedtime, that’s not going to work for you. Also, because vitamin A is one of the main nutrients in these liver capsules and also in liver, we want to make sure that there’s fat in with these livers. If you’re having these capsules, it’s important to have them with something that’s fatty. If you’re a rocket fuel latte and you want to have those with a rocket fuel latte, awesome. If you’re doing a breakfast thing and you’re healing from imbalances, just make sure there’s fat on there. I don’t need to tell you that. Our community, our high fat ninjas, so it shouldn’t be a problem for you. If you don’t like liver, this is pretty much your only option that’s clean and amazing and all the nutrients that I talked about. If you get it in conventional liver, the conventional liver just like when you get conventional meat, isn’t going to be as high quality as when you get grass-fed, grass-finish, pasture raised, awesome cattle that are happy and frolicking through the fields and that is what Vital Proteins makes their capsules out of. It says right here on the bottle, pasture raised. I trust these guys immensely. They make amazing products. I have their collagen and gelatin pretty much every day. Each bottle is about $30. This bottle will last you 30 days for about $30. It works out to be $1 a day, which is a lot less expensive than getting liver and cooking liver and cleaning up the mess, because they pop and crackle as they go and it’s messy. If you’re traveling too and you love liver and you can’t take liver with you, then take these. My clients who hate liver who have tried this product, say that they love it and it’s so much easier to take liver with you on the go. If you’re interested in giving Vital Protein’s Beef Liver a try, head on over to their site. 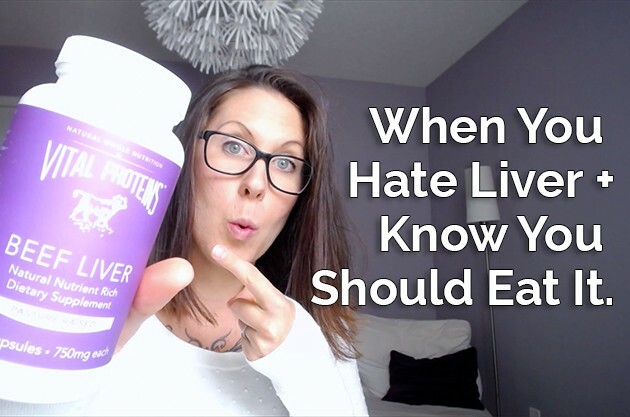 I’ve included a link below this video and grab your beef liver or your collagen or gelatin or don’t. Just now you know that liver is awesome. I love sharing these products with you that just make my life easier on my path to being healthy and awesome and healing my body. If you loved what I shared and you want to hear more from me, every Wednesday, make sure to subscribe to this channel. I’ve included a link up there and you can go ahead and subscribe and I will see you every single week sharing new information with you. If you’re interested in high fat living and you want to learn more about what it’s like eating fat and loving life, then you can check out my book, The Keto Beginning. I’ve included a link there and below. Check it out, see if it’s right for you, if not, that’s totally cool. Now at least you know how awesome liver is and that you don’t need to fry it in a pan, you can eat it in a capsule. I hope that you have enjoyed the information that I’ve shared today. I will see you next week. Bye.